Musical Ecologies continues Thursday, March 13 with New York-based composer/pianist Eleonor Sandresky. In a program of works for piano, live electronics and choreography that use her custom-designed digital sensor system called the Wonder Suit, Sandresky activates computer generated-sounds and processes through her pianistic and choreographic gestures. Working at the forefronts of music technology and avant-garde concert-as-theater, Sandresky will offer her 21st-century vision of the traditional composer/pianist. Arts Houston described her vision as "captivating and true;" composer/pianist Eleonor Sandresky's music has been performed on three continents. She has been a composer in residence at STEIM (The Netherlands) and The MacDowell Colony, among others, and has received grants from NYSCA, The Jerome Foundation, Meet the Composer, American Music Center, and the Lower Manhattan Cultural Council. At the same time Eleonor is one of New York's preeminent new music pianists, performing concerts throughout the world that have included premieres of new works by composers from Egberto Gismonte to Philip Glass, with whom she has worked since 1991. The depth of her experience as a performer informs her work as a composer in a very deep way, and she mines that experience for the hybrid work that she has been creating, blending movement, the acoustic and the electronic into one unique art form. Eleonor reinvented herself as a Choreographic Pianist with her evening-length composition, A Sleeper’s Notebook, premiered as a part of the Kitchen Keyboard Summit in 2003. In these choreographic works, she explores her deep interest in how motion translates to emotion through sound, tapping her experience as a performer for her compositions. Since 2009, she has been working with Michael Clemow and Semiotech on the design of the Wonder Suit, developed to fulfill her desire for her movements to initiate sound. 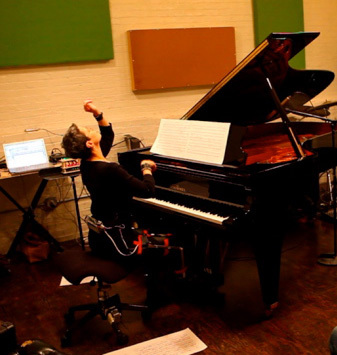 The Wonder Suit is a collection of wireless sensors that she straps onto her body and piano bench to allow her to initiate and control various electronic parameters in her pieces with live electronics. In 2013 she initiated a series of collaboration projects that she presented at Spectrum called Rétes: collaboration series. Each month she composed and rehearsed music with or by another composer performer. Her collaborators have included Pat Irwin, Kevin Norton, Kamala Sankaram, Jim Pugliese and Mary Rowell. She continues to perform with Pat Irwin. Her latest commission is for Parthenia, for baroque harp and consort of viols, and will be premiered in the Fall of 2014. Post a comment — Trackbacks closed RSS 2.0 feed for these comments This entry (permalink) was posted on Thursday, February 13, 2014, at 5:06 pm by Dan Joseph. Filed in press release.